From musical whips and exploding soda cans to flaming whips it is easy to see why Adam holds multiple Guinness World Records. All ages will be impressed by his amazing skills, Adam truly is a Whip Master. A variety of birds-of-prey, some endangered, display the unique skills that enraptured nobles long ago and made falconry the sport of kings. Heroines in Disguise are a singing, sword-fighting, and comedic adventure show! These ladies are on a mission to both empower and entertain as each tale they tell contains a heartfelt message disguised in witty innuendo and geeky puns. Be sure to check the ratings warning as their missions range from family-friendly fun to wildly nerdy and dirty loose cannon comedy! They're back, diving through fire, hurling machetes, and testing the limits of natural selection! Don't miss seeing your favorite acrobats endanger their lives in this hilarious, award winning show. The day starts with their "Sharp Knives and Stupid Humans Extravaganza" and ends with the incredible "Fire Finale". Come laugh, cheer, and become a part of the action! A privateer and patriot home on leave, Captain Drake is here to raise glasses, melt lasses, and leave knees weak in his wake. When your cups are empty, and your morals more so, come find him, he'll be waiting. America's rare traveling carillon. Weighing over 4 tons, this unique musical instrument features 35 bronze bells. The only musical act of its kind in the world. Cast in Bronze has been invited to perform for both Pope John Paul II and the Presidential Inauguration. Cirque du Sewer- the acrobat with rats and cats! As seen on ABC's "The Gong Show", physical performer/ rope walker Melissa and her trained animals perform stunts together that will change your ideas of what rats and cats are capable of! This Celtic steampunk barbarian blended band of minstrels features roguish vocals, rhythmic mandolin, harmonizing violin, intense percussion and blaring bagpipes. The CRAIC Show is a fresh, high energy, heavy medieval good time! See them on the Mêlée Stage. Our goal is to promote fellowship while researching the lifestyles and trades appropriate to the Celtic Peoples from 400 BC until 1746 AD. Although most members claim Scots, Irish or Welsh ancestry and do Celtic re-enactment, participation is open to anyone with an interest in period crafting, living history and entertainment, no matter what his/her ethnicity. 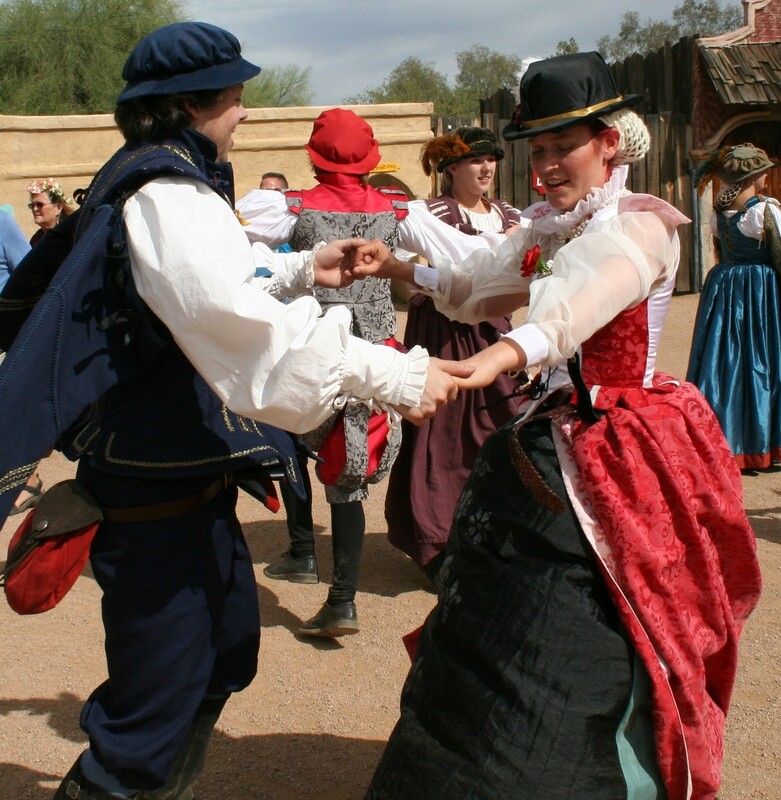 Performing historical dances from royal courts of the Renaissance, the troupe recreates the dances of old. The dances performed range from round dances to include children, to intricate couples dances designed to woo. Watch if you like, or join in the fun! The Danseries can teach you courtly dances of the era. This troup can be found behind Middleshire Stage. Hope to see you this and every year! Bob may be “ded” but with the help of his assistant, Sluj, he’s funnier than ever! Join his audience as he tickles your funny bone, turning his audience into “bobzombies”. The charming Prince of Spain and his faithful man servant have traveled to Fairhaven as ambassadors from their native land. The great swordsman and master of the whip will amaze and amuse with tales of the duo’s many adventures. Bells! Axe Handles! Razor-sharp handkerchiefs! See this locally-based English Folk Dance troupe. Morris Dancing is a proud English tradition and they love performing traditional dances with a 'Fairhaven' spin. Morris may be their specialty but keep a look out for their Hobby Horse, Danse Macabre and Abbot's Bromley Horn Dance, all during the Festival day! Come and join the melodious husband and wife duo of Papa Dill and Pepper, as they play and sing for you music influenced and inspired by Renaissance, Celtic and geek culture. They will play and sing for you songs of mythical beasts and regal you with historical stories of love and loss. Joined by the rest of their “spicy” family members you are sure to walk away having learned something new. Fireflicker is a curious young dragon who wanders the streets of the festival looking for shiny things to hoard, and is always excited to meet all the knights and princesses of the realm. They may even share some dragon gold with those who also have magic in their hearts! Ghazaal Beledi is a world fusion and tribal belly dance troupe with choreographies ranging from Middle Eastern belly dance, East Indian Bhangra, Bollywood and Rajasthani, and Spanish-influenced skirt and fan dances, to props such as sword and fire, Ghazaal Beledi is a high-energy fusion of passion, music and fun! Watch for Cliff Spenger's Green Man as it is a delight to behold. Equal parts mythical and environmental, the Green Man is a great opportunity for family tree photos. An interactive comedy show – part story telling, part audience participation, all hilarious! Join Gwendolyn as she regales audiences with her “unique” version of popular fairy tales, attempts to answer any question the audience throws at her, figures out what she wants to be when she grows up, and generally learns about life! A showman who is devoted to expanding upon the wonderment of children and adulta, Gypsy Geoff: juggler, physical comedian, puppeteer, international champion street performer and variety entertainer is both mesmerizing and enchanting. Come witness and be part of the master of mayhem and manipulation. The flurry of fire that is Gypsy Geoff. Mother Redempta and Sister Philomenia of the Sisterhood of the Wailing Souls have come to offer counsel to the visitors to the village. In their reverently irreverent way they will have you wailing with laughter. The Jamila Lotus Dance Carnivale performs fast-paced, original choreography and feats of balance and daring, featuring the live music of their dynamic Band of Eternal Souls! This limited-seating show appears four times daily at the rollicking Dancing Pig Pub at the entrance to the Joust Arena! Fairhaven's resident oddball, Jerome blends a combination of family circus entertainment with amazing performances of awe and wonder (among them: Bear-Trap Juggling!). Learn the ways of the Jester from the King of Fools himself, or simply sit back and watch his unforgettable display! All are welcome! The Jousters ignite all the spectacle and pageantry of the chivalric age. Armored knights compete in a three-part jousting tournament, a true test of skill, courage and horsemanship. Cheer your champions as they battle for the highest score in the original sport of Kings! Each joust is unique and an authentic quest for victory…until the end of final joust, where tempers flare and they perform a realistic recreation of a fight to the death! Join Pirate Shantyman and Bonnie Lass, in a non stop fun and crowd interactive comedy show! Filled with amazing fire eating, rope walking, and comedy their show delights all! Last show is Naughty and Rated LC! Lady Prudence, the Court Composer, sings Songs for All Occasions! Prepare to join the band with percussion for a peppy tune, or relax to a dulcet lullaby with lilting harp and sweet soprano. Meet her under her tree near the Royal Pavilion for a bit of song and to earn her Favour! For more information, see Facebook.com/Lady.Prudence.Piper. 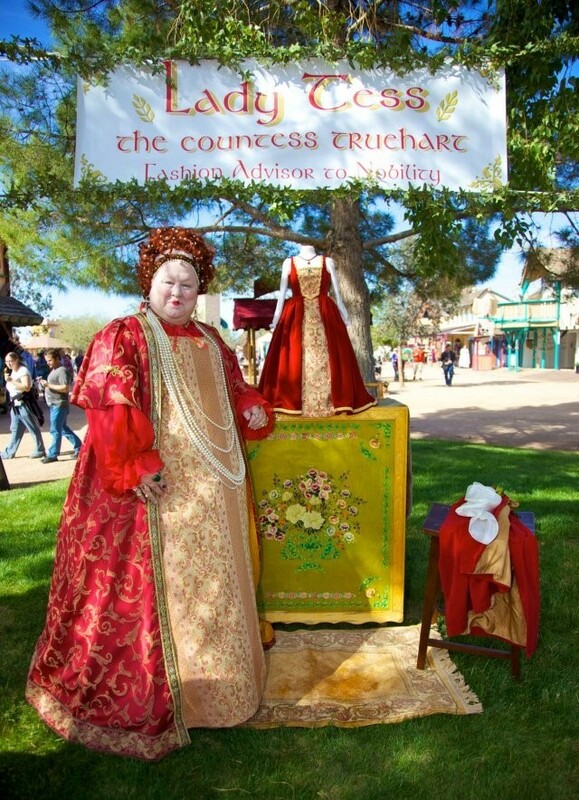 As the Fashion Advisor to Nobility, Lady Tess gives presentations to all visiting Noble Persons. For ladies, she explains a lady’s toilette--the bathing, hair dressing, and application of make-up; and shall explain and demonstrate the garments and accessories worn by Noblewomen. For gentlemen, she explains proper tonsorial care; and shall explain and demonstrate the garments and accessories worn by all men of Noble birth. This elegant and sophisticated show combines artistry and illusion as a beautiful statue transforms herself with magical grace into a Living Fountain. As music plays, delicate jets of water appear from her fingertips as a shimmering halo cascades from the crown of her head in this beautifully choreographed performance. Visually stunning! The London Broil “Core Audience” cheers as three comical comrades juggle with knives, clubs, and fire! AJ, Louie and Matt have performed thousands of shows together and have the perfect recipe for a hilarious, charming and innovative mix of free-flow comedy and spectacular team juggling. The London Broil Show: Comedy and Juggling, Well Done. The Lynx Show is a unique blend of magic, sword swallowing and comedy. Lynx is a veteran when it comes to performing at Renaissance festivals across the country. Not only is there audience interaction and participation but a strong positive message at the end. From death defying feats of amazement to bewildering moments that just can't be explained, The Lynx Show is sure to thrill you! So, don't miss out, be part of the fun! Mistress Bawd is an Interactive One-Woman "Musical Comedy" experience you are sure to want to experience. Whether you see her family approved, "Muse Show" or her, not for the kiddies, Loose Cannon, (LC) "Musical Comedy Show". You are sure to enjoy singing along, because you will surely return over and over again, to join in the festive fun of song. Meet Mother & Father Goose and their feathered friends. Drop by to say hello or stay to pet or hug their beautiful loving birds. Sarah performs traditional dance tunes on the harp. Sarah can be found in the streets of Fairhaven each year. Songs of the Nightingale : Here with stories from this universe and beyond the Nightingale and Baba Manouche ask that you lend your heart as they take you upon uncharted journeys through the magic of Music. With this whimsical songstress at your side you may find something within yourself you never expected! From the "Puckerbrush" woods of northern Michigan, the Puckerbrush Players perform old Irish folk songs and traditional music on Hammered Dulcimers. Sit, relax, and enjoy beautiful music played on these wonderful and ancient instruments. Yes! Hypnosis IS real! And with Rick The Hypnotist it’s pretty darned funny too! Want to ride a rocket ship to the moon? How about winning a million-dollar fishing tournament? Or temporarily forgetting your name? You’re never quite sure what will happen in this uproariously funny hypnosis show! Certified hypnotherapist Rick Stratton takes his volunteers on a journey they’ll never forget! The Sea Fairies ~ Living Mermaids!! Witness the wonder of lovely and charming creatures of the deep sea, the Living Mermaids. Transported to our village by Captain Kidd and his Privateer crew, the mermaids are curious to learn about life on the land and have come to Fairhaven to enjoy the celebration. Don't miss these magical merfolk, a topic of legend and lore! Shamus wanders the lanes offering his impressive services as a professional insulter. His fabulously pointed barbs will leave you laughing long after he has disappeared! 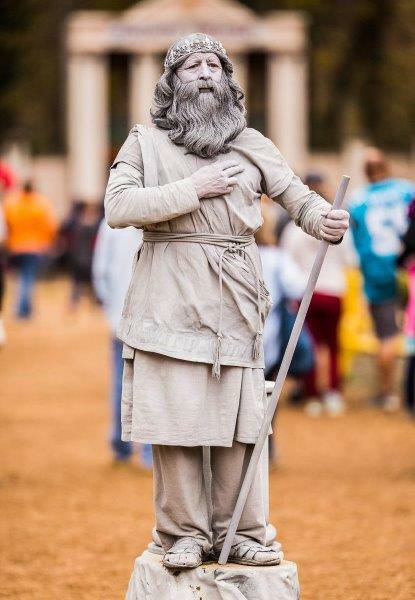 There are many Living Statues, but there is only one Lively Statue and his name is Comedius de Marbleous. Keep an eye out for this Living Marble Marvel. He has an aversion to pigeons, but he's not camera shy at all. He's all about photo ops with young, old, and those as ancient as he (he was sculpted in 1457). A band on the edge that fills a much needed niche in Celtic music performance, taking tunes out of the session and into the sensational with their own brand of humor and theatrics. This is not just music... this is an interactive spectacle brought to you by... MEN WITHOUT PANTS! The magic is in the title, these three men will dazzle you with their percussion skills and energetic attitudes. Always fun for the whole family! Outrageously unpredictable and unstoppably hilarious, these three twins tell tales with the participation of the audience. Adults will enjoy the twists in familiar stories like Robin Hood and the Big Bad Wolf. Twig is a curious, lively woodland sprite who embodies childlike innocence and wonder. Her bashful mannerisms and graceful flitting movement create a whimsical space that she warmly invites everyone to share. Rick and Jan Stratton present Snorkel - the Vaudeville Dancing Pig! Juggling, balancing, & a trained pig...Need we say more?! Come see Snorkel the Pig strut his stuff as he hogs the stage and dances his way into your heart. Love, Laugh, Launder... Repeat. Doing the laundry has never been so much fun! Come for some good clean fun with two wet, dirty women! Gerty and Sprout will be putting men to work for a full half hour, giving the ladies of the Village a well-deserved break. Bring your beer and someone special... or just bring your beer. And remember, what happens at the washpit, stays at the washpit." The Wyld Men present a hilarious, fun-for-all ages feast for the imagination that stands alone in the comedic landscape. 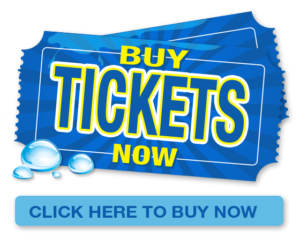 Come see this rollicking ‘Live Cartoon’ with its riveting rhythmic soundtrack, wacky sounds, captivating slow-motion fights and astounding and magical muddy special effects! With tales like "Jomeo & Ruliet" and "Tairy Fales", you'll hang on his every word, enjoying stories told “trippingly on the tongue”.